Nick Jonas and Priyanka Chopra are now back in town and the couples and star kids are still making a noise in town. Newlyweds Nick Jonas and Priyanka Chopra were spotted back in town, all smiles for the paparazzi. Meanwhile Priyanka's cousin Parineeti Chopra too was snapped outside a salon in Juhu. Another couple Malaika Arora and Arjun Kapoor made their way to a popular restaurant in Bandra. Both Arjun and Malaika were twinning in black, although they covered themselves with a white coat and shirt respectively. Another celebrity couple who got captured were Sajid Nadiadwala with his wife Wardha. Kiara Advani was also clicked at the airport in black tee and denims with a black overcoat and sleek looking bag. Meanwhile her alleged boyfriend Sidharth Malhotra was roaming around the streets in his Ferrari. In case you couldn't believe it yet, here's a closer look at him, with director-producer Dinesh Vijan. 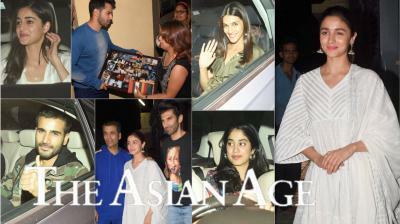 Kedarnath debutante Sara Ali Khan was also caught at the airport, but she wasn't alone either. Sara was accompanied by her movie's co-star Sushant Singh Rajput, who will also be seen in Son Chiraiya with Bhumi Pednekar. Not only Sara, even her brother Taimur Ali Khan was on a stroll with abba Saif Ali Khan, and he's surely amused to look at cows again. Meanwhile Taimur's cousin Inaaya Naumi Kemmu also looked cute while roaming around Mumbai in a pram. Sonakshi Sinha, in a white dress, found accompany in Aditi Rao Hydari before she left towards her car in a hurry. Sanjay Dutt was clicked on the sets of Prasthaanam in his new bald look which he has been rocking since some time now. Tara Sutaria, soon to make her Bollywood debut with Student Of The Year 2, got captured at an eatery.